5000km of Wilderness Travel by paddle and portage. There can be no better way to discover Canada than by canoe. Departing from Rocky Mountain House, Alberta, PACT journied across Canada, retracing the roots of our nation’s history through the rivers and lakes made famous by early explorers. We traveled for one-hundred and twenty days before docking at Lachine, Quebec, the traditional departure point for the North-West Company. Click HERE for a detailed listing of the waterways we travelled. Canadian history begins in the canoe. We are a nation born from its travels. The canoe is the original cross continent transportation method through its highways of rivers and lakes. It has facilitated in trade between nations, the exploration of empires, the excitement of thrill seekers and the solitude of peace seekers. It has allowed for the meeting and clashing of peoples and empires. It has made possible the migration of settlers west. It has provided means for mapping and documenting the remotest corners of the country. Its construction once a necessity, now resides in the hands of artists. It remains a popular pastime for weekend cottagers and the passion of adventurers. PACT traveled by canoe across Canada on the rivers and lakes made famous by the original explorers, and were ever conscious of those who came before them. Champlain, Radisson, Pond, Mackenzie, Thompson, were remembered by the crew for their contribution to cross-Canada wilderness travel. PACT departed on March 16th 2013, from Rocky Mountain House National Historic Site, once the furthest west outpost of the North-West Company. They stopped at Fort Edmonton to trace the development of the five forts along the river that resulted in the city of Edmonton. They stopped at the oldest community in Saskatchewan and important river crossroads at Cumberland House. They stopped at Height of the Land Portage at North Lake and toast the pays d’en haut in the traditional voyageur style. 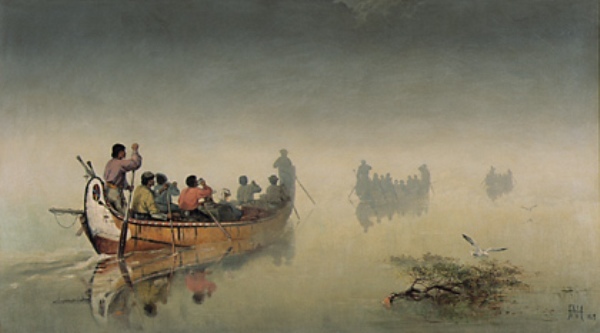 They portaged the Grand Portage to celebrate with the ghosts of the wintering Nor’west partners. They offered tobacco at Hat Point on Lake Superior to ask for safe passage on its waters. The ventured onto the largest lake on Earth and conquered the north shore of Superior in 14 days. They struggled and cursed the historic La Vase portages connecting Lake Nippissing to Trout Lake. They paddled down the Ottawa River and pass underneath the Gothic revival of the Canadian Parliament buildings. They finally docked 120 days later at The Fur Trade at Lachine National Historic Site, the traditional departure point for the North-West Company on September 12th, 2013. For PACT, this has been an intimate journey with Canada’s diverse landscape, its people, and its history.